Properties in Swanton average 4.5 out of 5 stars. Property 3: Impressive Mountain Log Home in tranquil setting! Family-friendly, lakefront home w/ dock, deck, & views - dogs welcome, too! Property 5: Family-friendly, lakefront home w/ dock, deck, & views - dogs welcome, too! Property 6: Charming cottage with outdoor fire pit & lots of community amenities! 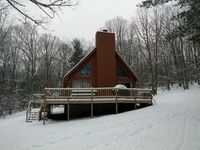 Lakefront cabin w/ private dock, hot tub, & game room - dogs okay! Property 13: Lakefront cabin w/ private dock, hot tub, & game room - dogs okay! Charming log cabin close to area activities! Property 14: Charming log cabin close to area activities! Lakefront 5 Bedroom w/Dock Slip: The Perfect Deep Creek Home for Relaxation! Property 15: Lakefront 5 Bedroom w/Dock Slip: The Perfect Deep Creek Home for Relaxation! Cozy, dog-friendly home on the lake w/ shared dock & lovely views! Property 17: Cozy, dog-friendly home on the lake w/ shared dock & lovely views! Delightful 3 Bedroom home in a quiet tranquil setting! Property 19: Delightful 3 Bedroom home in a quiet tranquil setting! Exquisite 5 Bedroom Luxury Log home offers amazing lake & mountain views! Property 20: Exquisite 5 Bedroom Luxury Log home offers amazing lake & mountain views! Six Bedroom Home On 3 Levels With Lake View, Access. Family And Pet Friendly. Property 21: Six Bedroom Home On 3 Levels With Lake View, Access. Family And Pet Friendly. Lovely 4 bedroom home in tranquil serene neighborhood! Property 24: Lovely 4 bedroom home in tranquil serene neighborhood! Property 25: Beckman Peninsula Spectacular Location! Property 29: Charming Lake Front Cottage with Private Dock! Picturesque 3 Bedroom Home offers luxury accomodations in a tranquil setting! Property 30: Picturesque 3 Bedroom Home offers luxury accomodations in a tranquil setting! Captivating 3 Bedroom Lakefront Cottage w/ Private dock & Hot Tub! 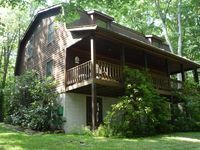 Property 34: Captivating 3 Bedroom Lakefront Cottage w/ Private dock & Hot Tub! Lake access home with great outdoor living space & tasteful decor! Property 35: Lake access home with great outdoor living space & tasteful decor! Deep Creek Lake State Park is steps away! Property 37: Deep Creek Lake State Park is steps away! Split-lakefront home w/ private hot tub, dock, firepit, porch & views - Dogs OK! Property 41: Split-lakefront home w/ private hot tub, dock, firepit, porch & views - Dogs OK! 4BR Chalet - hot tub, fire pit, pool table & views! 4th of July open! Property 43: 4BR Chalet - hot tub, fire pit, pool table & views! 4th of July open! Lake front home with private dock & views! Property 47: Lake front home with private dock & views! Level lake front & fire pit on 1+Acres! Property 48: Level lake front & fire pit on 1+Acres! My family had a wonderful weekend and can't wait to come back. We enjoyed the hot tub, the wildlife and the peacefulness of the location. Thanks for a great stay! This house was perfect for our family reunion - we had 4 children (ages 3, 8, 9 and10) and 7 adults. There was plenty of room for everyone to have their own space and yet be together on the main floor. The house has 4 bedrooms upstairs and 2 bedrooms on the lowest level. The middle level has a good size living room to play games and socialize as well as a large dinning room for meals and a decent size kitchen. We cooked almost every meal in the house, and there were plenty of dishes to accommodate a large group. The location being close to the state park was also wonderful and it is an easy quick drive to town. Having a park pass available was nice too because although the park is $3 a car, we hiked at swallow falls where it would have been $3 a person to park. The only complaint I have about the house is most of the beds are pretty hard. Softer mattresses or mattress pads would make the beds better. The owners are very tentative and caring, they called after we checked in and make sure there were not questions or problems. Then they followed up with us after to make sure we enjoyed our stay. We had a great time and if we return to deep creek, we will stay here again.